This post has been LONG awaited. We started working on the plans of building our home over three years ago and the thought of having a finished space to live in, let alone photographed to share with all of you seemed like a lifetime away- yet here we are!!! I’m so excited to kick off our new home tour with the library. The entryway is light and airy and as you peer into our home your eyes instantly catch and are drawn into this moody, cozy and inviting space. We had a home office in our previous home with a formal desk that most times felt sterile and un-inspiring to sit at while working. 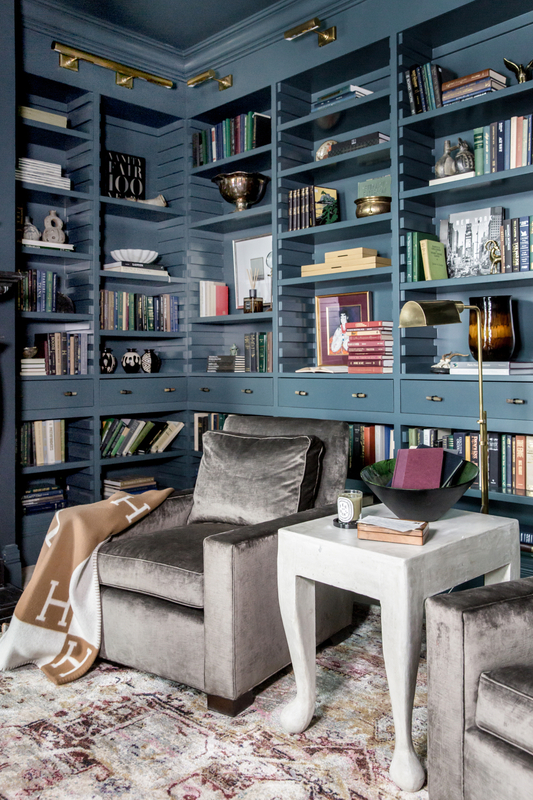 When Drew and I were talking with our designers to kick off the ‘the home office’ space it was clear that this room was always meant to be a library. 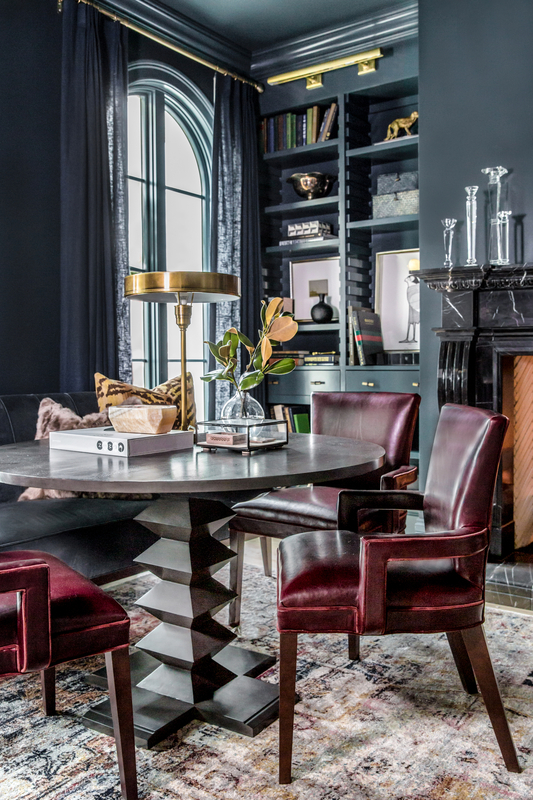 I love how the Alice Lane design team opted for a work table with three cozy leather chairs and one comfy and plush velvet sofa for gathering over one large desk meant for one. So far we have played many rounds of Mexican Train and Drew and I have both gotten loads of work done on our laptops while the kids stack up their blocks or color, all while being all while being side-by-side at the same table. It’s one of my favorite moments of the room. I love how collaborative it feels. This room holds so much meaning. The shelves are filled with pottery and artifacts from Drew’s time in Peru. He lived there for two years serving a mission for our church when he was 19. He learned the language and was fully immersed in the culture. In those two years he fell in love with the people, it was a momentous event in his life and time that will always be cherished. He brought back so many beautiful treasures from the people he served and before this space, those treasures had been sitting in a dusty box for over ten years! I’m so glad Alice Lane saw the beauty and meaning in each piece and found such beautiful places for them. If you look in the images you’ll be able to spot the pottery and the hand woven baskets. Another piece that is so special in our library is the original artwork created by our dear friend, Rob France. I’m sad the photographer didn’t get a closer shot- it’s the artwork on the left side of the mantle. In these images ‘BIRDY’ (as Jackson calls him) is placed in a temporary frame but he’s currently in the hands of an incredible framer who is doing a custom matte and frame. I’ll share once I get him back!! You can shop our library collection here. Wow! This iS absolutely stunning! They did an incredible job. I’m so glad you this space turned out to be a library! 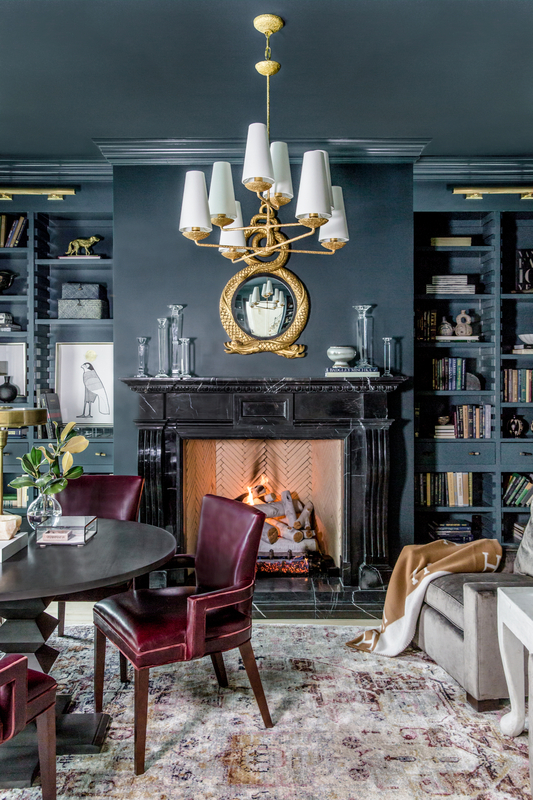 It is stunning and I love that there is personal meaning behind the decor on the shelves! Gorgeous space! It seens So inviting! The color combinations are striking! 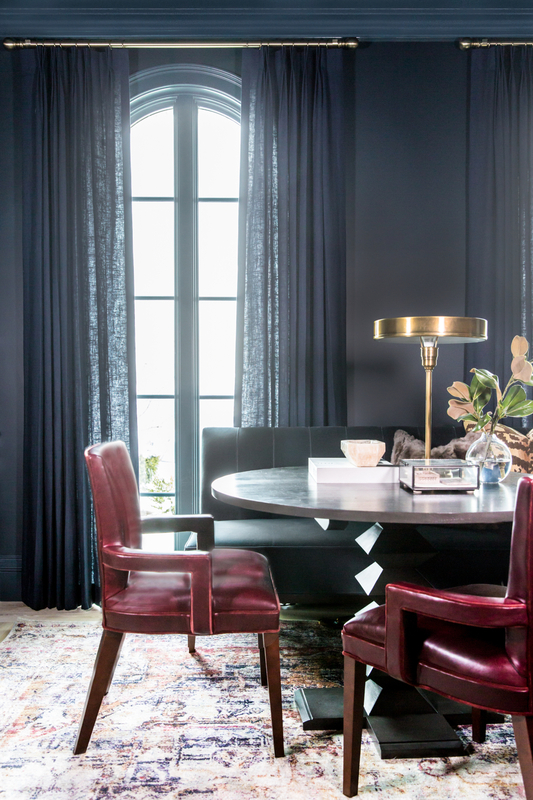 love the BM Paint & how the color extends across to the curtains & ceiling to complete the room. 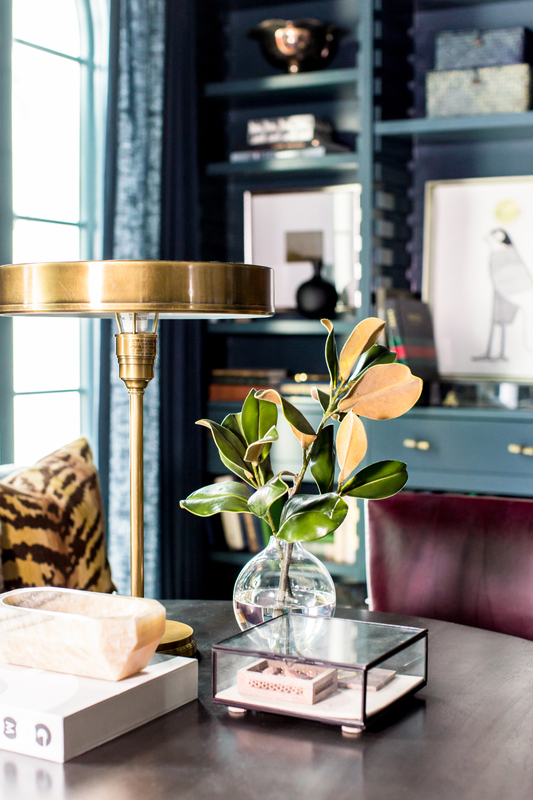 the gold/brass accents, the rug, & fur/tiger pillows are the icing on the cake! What a jewel box of a library!!! Just Lovely! What a smart idea having a library instead of an office. It’s absolutely stunning! Rachel – this library is exceptional! the design and details of this space are so perfectly done. great job by alice lane. I hope you continue to enjoy this space with your family. The room is gorgeous. It makes you want to sit and curl up with a book all day! 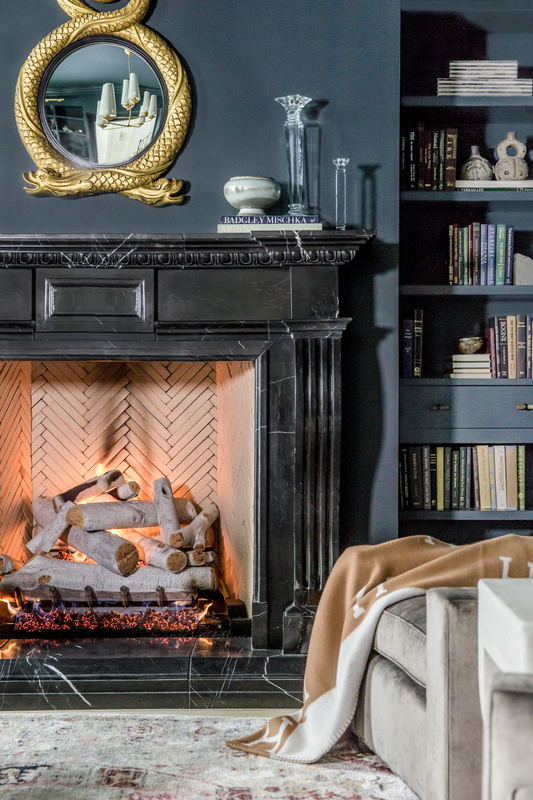 I especially love the detail work in the fireplace. Omg! I loooove it. So amazing guys! I am literally squealing. this is amazing! can’t wait to see the rest of your beautiful home! LOVE how this came out! I think its great to have a library and also a place you can work if you need to. The wall color is amazing. What a beautiful library, Rachel! ? As soon as I saw your IG stories I identified handicrafts from my country ❤️ and came fast to see the whole interior design. Amazing work and such a perfect display of this traditional pieces. 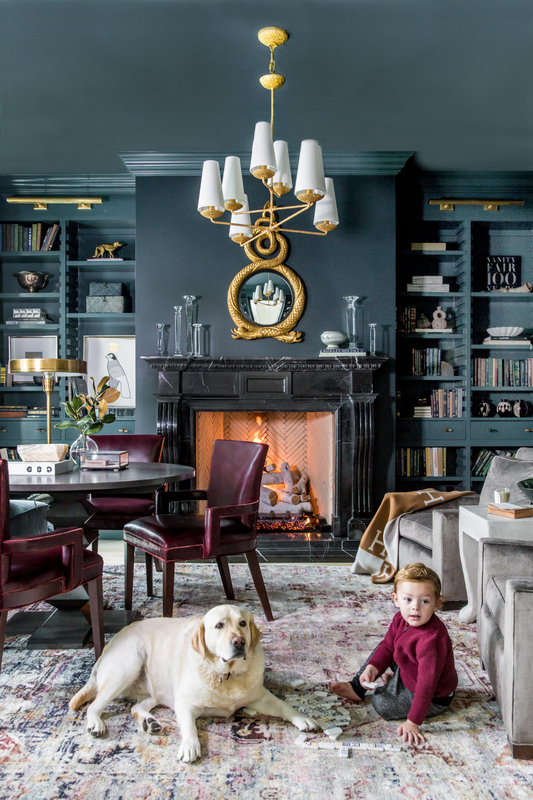 The furniture, color palette, and of course Jackson and Dash, the best models ? Absolutely love the meaning behind the design of the room and all the special pieces that you can finally display. I am sure that looking at those brings back so many incredible memories for Drew and that each one acts as a reminder of what is important to your family. Also the dark color is AMAZING! Love, love this. Please keep sharinf more of your beautiful Home! Kitchen especially! 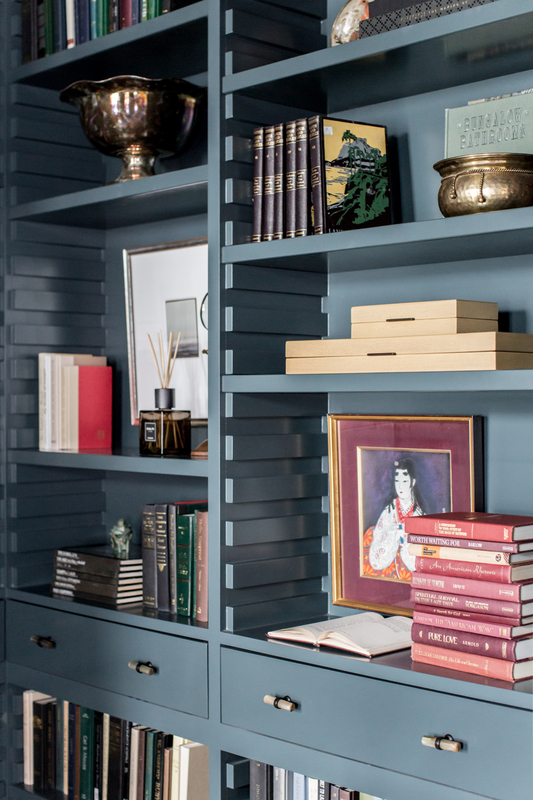 I love the colour of the walls and shelves! Beautiful! BeautifuL! Would you please share where the drapes are from? It WASN’T lunked! Thank YOU very much! THe library is so beautiful and well designed! The gold accents are perfect! Hi Rach! 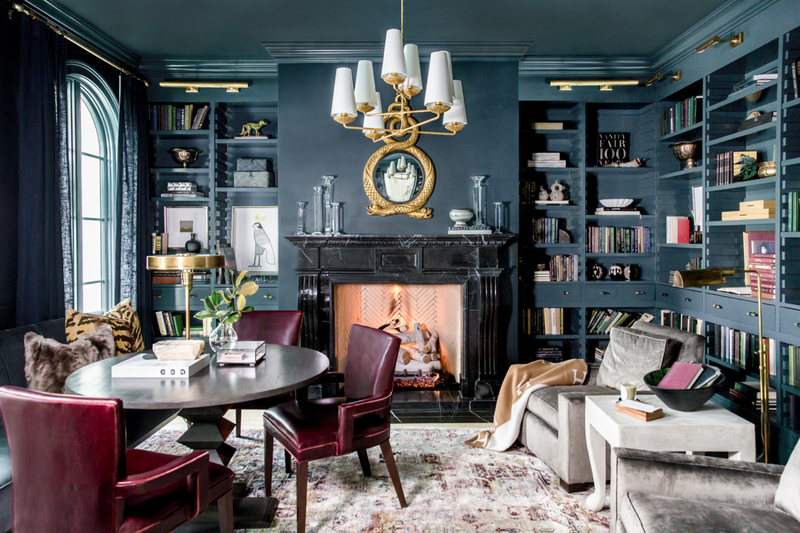 Huge fan of yours, and swooning over Your beautiful library. Can you provide Some additional information on the bookshelves? I love how (it seems) you can adjust the height Of each shelf with the tongue and groove. Is this a custom design? Any recommendations for installing this? I absolutely LOVE this room! we just built a house as well and have been working on decorating it in a similar style; however, it is tough to find pictures as I do not know what you actually call this “style” — thoughts? GOrgeous space! could you give where the hardware on the shelves are from? absolutely stunning rach!! (and drew of course) i love every detail and especially love how warm and inviting it looks. it’s not “stuffy” looking like most libraries/home office spaces can be and can ACCOMMODATE everyone in the family. even dash!! i cannot wait to see the other spaces in your new home. it’s a dream.. Absolutely Love the paint colour and the fact that it covers the ceiling too!!! Gorgeous! i CAN’T GET OVER THIS SPACE. truly incrediblE. YOU GUYS HAVE DONE THE MOST AMAZING JOB!! This library looks like straight out of a magazine! This is absolutely breathtaking. you guys did an amazing job – I am like, picking my jaw up off the ground. GORGE! i absolutely love this space! i love how daring that paint choice is, but at the same time, it feels so comfortable! Such a beautiful and unique room! I love the combination of feminine and masculine pieces & colors! Wow! I love the library!! This is really innovative!!! 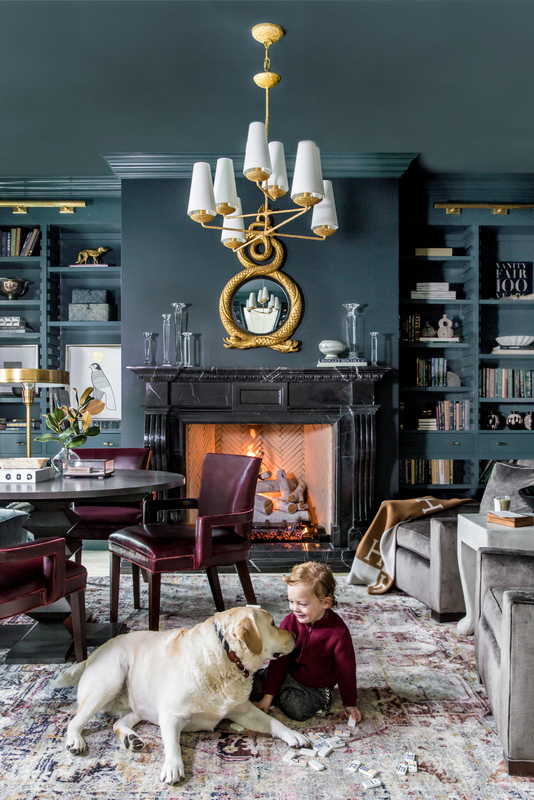 IT’S A COMBINATION OF ELEGANCE AND FUNCTION THAT SHOWCASES DREW’S PERU TREASURES AND ALSO GIVES SPACES FOR THE FAMILY TO SPEND TIME TOGETHER. YOU AND ALICE LANE TEAM HAVE created a new definition of home office!!!! It doesn’t have to have a large desk it can be a round table where people can work together side by side and where kids can play boardgames there when they get a little older. You and the alice lane team never fail to surprise me!!!! Thanks for sharing your private space to us. Coz I have an imaginery home I can entertain myself when I am alone. What a stunning space! 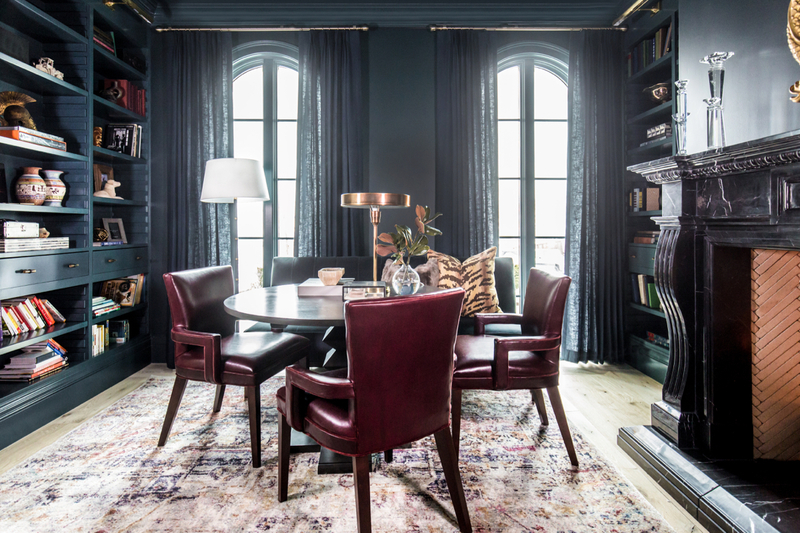 Love all the darker colors you went with for this space. It makes it feel so cozy! 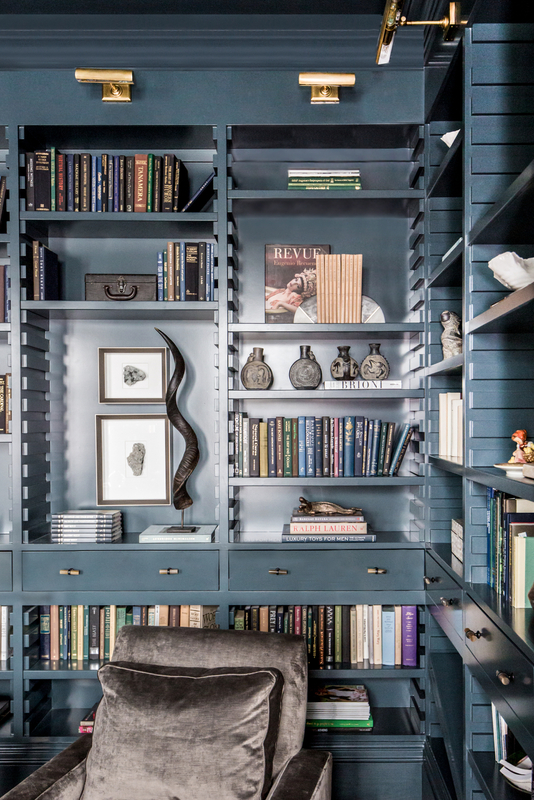 Such a beautiful room and I love the idea of a library instead of a home office. Every detail is perfect! Thank you for sharing and I cannot wait to see the rest of your stunning new home. your library is absolutely stunning! I’ve been following your instagram for years now, and i recently decided to take the plunge and create.a study/personal development blog and an instagram account for my art work: @zahraserajart. I really hope you might be able to check it out ;) as I would like to get permission from you to draw Isla Rose!